In the three weeks since the blog has been updated, Trev and the rest of Zero Race has travelled all the way through the USA, has crossed into Mexico, and has just arrived at the World Climate Change conference in Cancun! 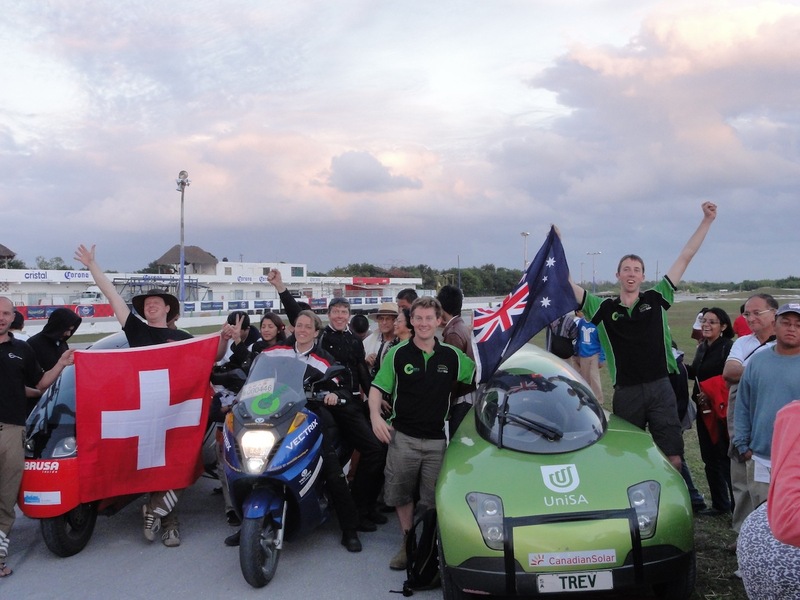 Our arrival completes the second leg of the Zero Emissions Race around the world and more than 23,000 km of driving since leaving Geneva in August. Trev has been driven through North America from Vancouver to Cancun by Nick and Andrew, who have put in an enormous effort to overcome challenges such as reliable charging access, long driving days, cold weather, troubles with Trev’s motor controller, Mexican speed bumps and potholes up to half a metre across and 30 cm deep! A very tired Andrew and Nick have now been joined in Cancun by Peter, and the rest of Team Trev are hugely proud of their efforts. Trev will help spread the message in Cancun that we need to be developing alternative means of travel with low carbon emissions and low energy use. In a few days’ time we will put Trev on a ship back to Europe for the final leg of Zero Race, arriving back at the start line at the UN headquarters in Geneva in late January. There have been many highlights of the trip through North America. We will write about these in future blog posts, coming soon. We are very grateful for the ongoing support of our sponsors who have helped us get this far: UniSA, Google Australia, Galaxy Resources, EcoGreen Electrical, Design Ecology, ABN Newswire and Catcon. This entry was posted in Events, Sponsorship, Zero Race. Bookmark the permalink.